Created by the interaction between the experience of the Antinori family and the demonstrated high viticultural quality of a territory, Franciacorta, the “Classics”- Marchese Antinori Cuvée Royale, Rosé, and Blanc de blancs - are produced from a selection of Chardonnay, Pinot Nero, and Pinot Bianco grapes. The Montenisa estate is located around the hamlet of Calino, near Lake Iseo in the heart of the Franciacorta appellation. The vineyards surrounding the proprietary villa of the Maggi family have been the heart of the production of Marchese Antinori Franciacorta since 1999. The must was fermented in stainless steel tanks. The second fermentation took place in bottle and the wine remained on its lees for 24 months before dégorgement. A light yellow in color with a creamy bubbling and an elegant and persistent sparkling. The nose is fragrant and expressive with fruity and floral notes which recall apples and white peaches. The flavors are lively and fresh with a fine balance and a perceptible elegance and finesse. The ideal serving temperature for the wine is between 45° and 48° Fahrenheit (7°-9° centigrade) Matches with food and occasions for drinking: With hors d’oeuvres, as an aperitif, and with fish. Its vibrant crispiness make it a perfect wine as an after dinner drink as well. The Vignaferrovia vineyard takes its name from a characteristic old nineteenth century railway station still located a short distance from the vines. At Castello della Sala, an area historically important for white wines, Pinot Nero offers an authentic and typical expression of its variety with a strong territorial character. The label was designed by Silvio Coppola in 1974 for the release of Tignanello 1971. The idea to commission this artist was discussed at an event at Castello della Sala in 1973. Silvio Coppola was an important Italian graphic and interior designer who was famous for his minimalist lighting fixtures and austere furniture but also for book cover designs for Italian publishing company Feltrinelli. Silvio Coppola was the perfect match for the job. The Vignaferrovia vineyard grows on rocky, gravelly soils, a condition that naturally limits the grapevine’s growth rate and enhances the quality of the berries. The 4 hectares (10 acres) of Pinot Nero grow along the hillsides shaping the landscape into a series of sinuous terraced vineyards. Marchese Piero Antinori, the current Honorary President, decided to have his father, Niccolò Antinori, sign the label as a sign of recognition for his father’s confidence in him. Southwestern vineyard exposure allows sea breezes to mitigate hot summer temperatures and limit heat spikes. The particularly hot climate of Castello della Sala has forced agronomists to invent new ways to protect the grapes from the hot summer sun. The vines’ shoots are allowed to grow in length and are then folded over the plant so its leaves can shade the Pinot Nero grape clusters. The Antinori family wanted to give their own deeply personal interpretation of the historic wine, Brunello di Montalcino. The wine’s name honors the Monaldeschi della Cervara family who was the historic owner of Castello della Sala in the XVI century. 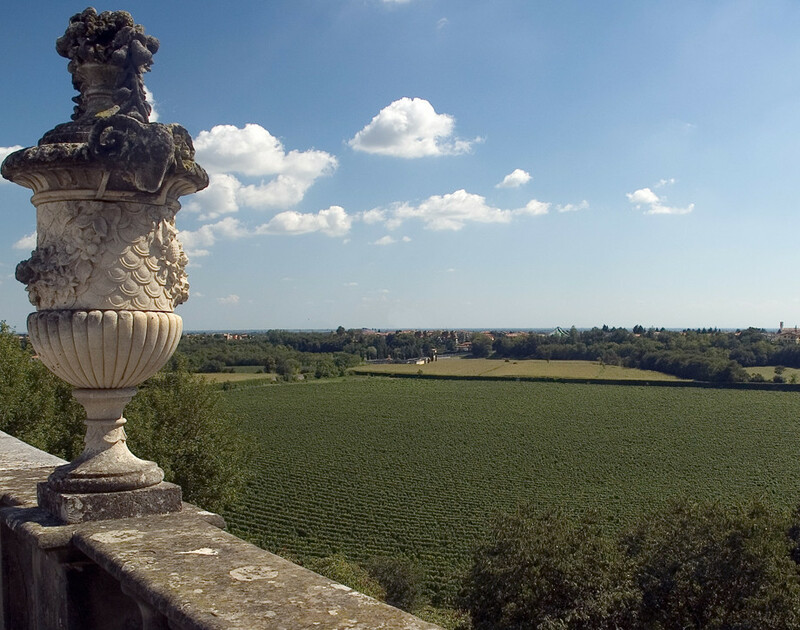 The Guado al Tasso estate’s most characteristic geographic feature is the Bolgheri Amphitheater, a beautiful plain encircled by rolling hillsides that faces the Tyrrhenian Sea. The shape of the territory creates a unique microclimate with beneficial temperature fluctuations. The estate’s vineyards are located at the foot of the amphitheater, an optimal position as cold nocturnal breezes cool down the vines. These particular climatic conditions give the grapes pronounced aromas and guarantee a perfect ripening of the berries. Poggio alle Nane comes from a winegrowing area well known for its production of high quality wines, an area in which both Cabernet and Carménère best express their characteristics. Aleatico, an old and traditional Tuscan grape variety grown since Etruscan times, is able to give a modern expression of itself in this unique territory. Guado al Tasso added the Antinori family’s historic family crest on the capsules. Cervaro della Sala was one of the first Italian white wines to have malolactic fermentation and aging take place in barriques. Poggio alle Nane’s name comes from the area where its vines grow. Duck breeding farms once existed and the name “Nane” is local dialect for duck. The vineyards extend from the hillside to the lake that are still part of the property. “A” represents in one single letter the combination of the estate’s initials, Fattoria Aldobrandesca, and the grape’s variety, Aleatico. Guado al Tasso designed a label with the Della Gherardesca family crest and the initials DG as a tribute to the former estate owners. The idea behind Cervaro della Sala was to craft a white wine able to age over time. “A” was crafted following the family’s pursuit for exceptional balance between Aleatico’s pronounced character and the unique qualities of the estate’s volcanic soils. In 1985, Renzo Cotarella, who was chief enologist at Castello della Sala at that time, made the first vintage of Cervaro della Sala. The estate is located in the heart of the Franciacorta production zone around the centuries-old hamlet of Calino. The vine has always been cultivated in this area of important wines. Some in fact maintain that “Franciacorta” has its origin in the phrase “Petite France”, an affectionate name given to it by Charlemagne.